These bags are made of 4 ply material. 3 inner layers of material, and 1 outer layer, for maximum performance, dust retention, and durability. Beware of cheaper single ply bags, as they may break or burst during use. The cardboard collar of this bags measures approximately 6.75" x 4.5". 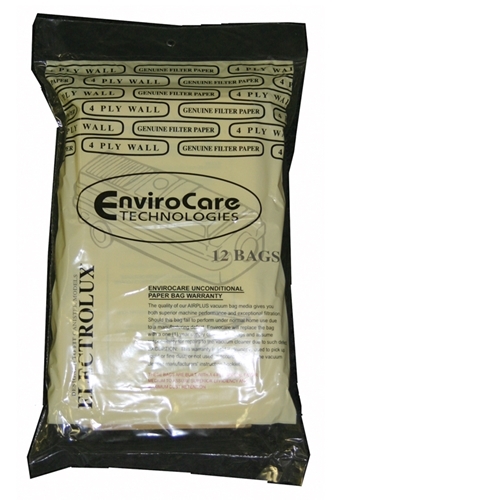 These bags also have a rubber seal, to prevent any dust leakage when replacing th vacuum bag. These bags will fit Most canister models since 1952. These bags will fit the following Electrolux models; Model LX, E, AE, S, AF, R, G, L, & 1205 Golden/Super J, Olympia One, Silverado, Diamond Jubilee, (Grand) Marquise, Legacy, Ultralux (LX/Classic), Hi-Tech 2100, Diplomat (LX), Ambassador (III/Plus), L-E, Classic, and Epic 6000/6500. If your vacuum bags cardboard collar measures 5.75" x 5", you will need to use Electrolux Style R Vacuum Bags. If your Electrolux's model number begins with "EL", then you have the Electrolux Oxygen bag, which takes Eureka style S bags.